Pays d'Agenais, Aquitaine - Domaine de France Gîtes, Chambre d'hôtes - Holiday rentals. Penne d'Agenais, Lot et Garonne, Aquitaine. Domaine de France Gîtes, Chambre d'hôtes - Holiday rentals. Penne d'Agenais, Lot et Garonne, Aquitaine. Penne d'Agenais is one of the most picturesque bastide villages in the region, boasting restaurants and cafes as well as craft businesses, such as pottery and art studios. 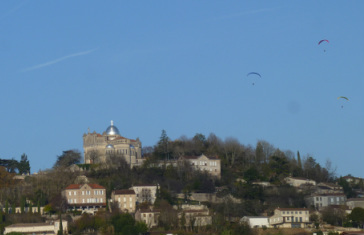 The village is home to the impressive Basilica, Notre Dame de Peyragude, which overlooks the village and the River Lot. Motor boats and canoes/ kayaks are available for hire from Port de Penne and there are plenty of marked popular walks to follow in the countryside around Penne. Described as the “Tuscany” of France, Lot et Garonne in Aquitaine is a department famous for its countryside with orchards and vineyards, farms, oak forests and quaint medieval ”bastide” villages. Penne overlooks the River Lot , and because of this perfect defensive position, the village in the past was strategically important. The area is rich in sites of historical interest most of which date from the period of French-English rivalry in the 13th century! The friendly local population is proud of its agricultural traditions. They certainly enjoy the fruits of their labour! Villeneuve-sur-Lot, a ten minute drive away, is the nearest town with a wide choice of eating houses, museums, twice weekly markets and plenty of entertainment in the high season. The prefecture and Lot et Garonne department capital, Agen, is just 30 minutes by car, 20 minutes by train from Domaine de France. The village railway station is within 2 minutes walk. Agen is the commercial capital for the surrounding fruit growing region. There is plenty of shopping, daily markets and a wide range of restaurants. Professional rugby, theatres and cinemas and even a theme park are among the many attractions nearby. It is just under 2 hrs to both Bordeaux and Toulouse by road (A62) and both are accessible by train too. For those who seek other activities day trips wine tasting and sampling the superb gastronomy (canard, foie gras and so much more) of Lot et Garonne are good reasons to base your holiday at Domaine de France. In the region you will also find chateaux, including Bonaguil, Beynac and Biron; other medieval towns, including Cahors, Monflanquin, Pujols, Domme, Belves, Monpazier and Sarlat. ​Caves, including those at Fontirou, Gouffre de Padirac and Domme are all easily accessible from here. Unspoilt countryside, rivers and beautiful gardens (eg the famous Water Lily garden near Temple sur Lot) and small unspoilt villages - several classed as 'most beautiful villages in France'. Much of the most beautiful rural architecture in France can be seen here - ancient houses, barns, pigeonniers and churches simply form part of the unchanging landscape. The Lot et Garonne, Lot, Tarn et Garonne and south Dordogne area of France offers the perfect combination of things to do and see, a perfect place to relax and unwind.